With rounded one piece skull rising to a high roped medial comb, projecting forward to a broad obtusely- pointed peak, struck with an Augsburg control mark and an armorer's mark, and backwards at the nape to a rounded integral neck- guard and each side with a hinged cheek-piece flanged outwards at its lower edge to serve as a continuation of the neck-guard and pierced at its center with five small auditory holes. The helmet formed at its main edges with file-roped inward turns accompanied by narrow grooves and decorated in low relief at the center of each cheek-piece with a circular panel and elsewhere with bands and borders burnished bright against the original black-from-the hammer finish and retaining its original lining. 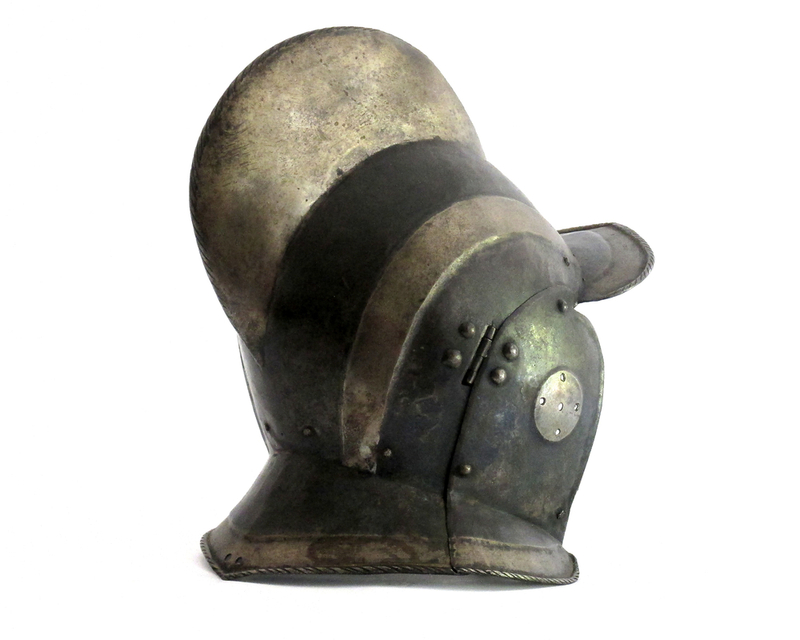 This helmet is a rare find in this un-touched original condition.